And whether you like it or not, tooth color matters (specifically in the United States). I’d argue, way more than how straight your teeth are or if you have that gap you hate… tooth health and thus overall health is often graded by the public on their shade. It isn’t fair and usually isn’t even accurate. If you’re in this boat, there’s a few things you can do to help get the smile of your dreams. First, you must get a cleaning and exam with x-ray images. We often say in-office will whiten while at-home will “brighten”. It’s no question that in-office professional whitening will give you the biggest, most noticeable effect. We can offer stronger products you can’t just buy over-the-counter or online. We also take steps to ensure your gums don’t get “burned” and other precautions to help with general sensitivity. For in-office whitening, PLAN AHEAD. These 90 minute appointments are booked well in advance and “squeezing it in” before your cousin gets married next week probably won’t happen. Example of teeth whitening strips. Short on time or money? Give at-home products a spin! Over-the-counter or online options DO work, they will just take longer and therefore you’ll often experience more sensitivity. Not all at-home products are made equal: White strips may LOOK the same, but did you know you can buy stronger ones at dental offices? We offer two kinds—my personal favorite for strips are the professional Crest 3-D Advantage. It’s a two week treatment (although you can always do less and take a break) and they are very textured! They stick a lot better than others we’ve tried. Strips aren’t your only at-home solution! Whitening toothpastes don’t hurt to try (don’t expect shocking results). We also offer GLO at-home whitening vials (you quickly paint it on your teeth) or the GLO at-home whitening system (see image below)! At just 8 minutes at a time, everyone can have time for whiter teeth. See more about how it works here: https://www.youtube.com/watch?v=X4uc73GEUKc The GLO at-home system is similar in style as the professional in-office, but the strength of the whitening gel will of course be higher in-office. How fancy you can look with your GLO at-home whitening. You can also get over-the-counter or professional whitening trays to fill with product (and usually sleep in); these aren’t our favorite but we do offer gel refills if needed! So at-home or in-office, which is right for you? Many people try at-home and realize they want MORE so then they schedule in-office. Others don’t want to do the at-home, lengthier treatments and they just want whiter teeth RIGHT NOW. As mentioned, if you truly want whiter teeth and not just brighter, you will most likely need in-office services then you can just maintain with at-home products. Learn more about our cosmetic services here! Remember, if you have filling material, crowns, or veneers, you cannot whiten them with any of these products, but we can definitely provide a treatment plan to get you the smile of your dreams! If you have gum disease, are a hard brusher, or experience generalized tooth sensitivity already—you definitely want to take precautions to help and know that it may still create some soreness. GLO Professional In-Office whitening boasts to have some of the lowest sensitivity on the market (which is why we offer it), but there is never a guarantee it will be pain-free :( …you can be prepared! Talk to your healthcare professional about whitening and any sensitivity you have already; they may recommend some specialized products. Buy a sensitivity toothpaste and use it daily for at least a couple of weeks before whitening. It takes a couple of weeks to achieve the maximum benefit but these toothpastes usually do not fight cavities—we recommend using it once a day and a traditional toothpaste for your second brushing. The second part of this tip is to NOT RINSE! You want that to soak in so just spit it out as best as you can. This takes some getting used to, we know! After whitening if you are a little sore or experience “zingers” (totally normal), you can take any over-the-counter pain medication that you’re comfortable with. Take an anti-inflammatory pain medicine, like Ibuprofen, BEFORE your professional whitening appointment! In-office whitening will generally run $300-500+ if you dig around online. At-home products like professional grade whitening strips will be under $100. The question is—how white/bright and how soon? If professional whitening is what you want, did you know CareCredit can offer zero-interest financing for those who qualify? It’s true! Cassie, our Treatment Coordinator, can even help you to apply. Riverbend Dental Wellness Members receive promo pricing on professional whitening at any time! Long story short—here are our top tips for whitening natural teeth! Bonus tip: Pick the right lipstick! Our local friends at New Skinsations med spa, who recently celebrated 15 years in business, recommend picking a lipstick that has blue/cool undertones rather than warm undertones. Pick true reds and pinks or neutrals with cool undertones. Stay away from warm corals or beige. If you’re feeling bold, you could even go with a navy or plum lipstick! 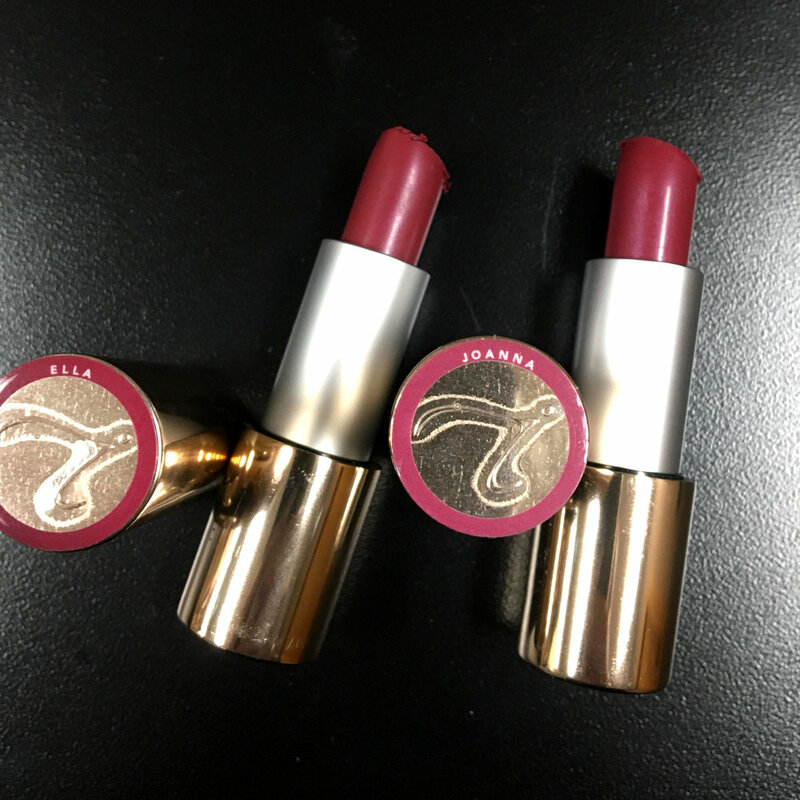 For more every day options, the New Skinsations ladies are loving Jane Iredale’s “Ella” and “Joanna” shades right now to get a sparkling smile! Special offer for Riverbend & Beyond readers: mention this blog post at New Skinsations to get a FREE LipDrink Lip Balm Deluxe sample with the purchase of any Triple Luxe Lipstick! Located at 751 W. Stadium, Jefferson City, MO. Offer good until March 31st, 2019. Current favorite lip colors for whiter teeth! See above for a special offer! Still not happy after whitening? If whitening just doesn’t do it for you to your satisfaction or you have a lot of existing dental work, crowns or veneers may be right for you! We often see patients who want the full smile makeover and we have the highest standards to make sure your smile is sparkling but natural. (Because nobody really wants Chiclets for teeth. P.S. Don’t forget—Riverbend Dental Wellness Members get promotional pricing on in-house professional whitening ANY TIME!